new mower is delivered and doing a fine job! Shown here is Bill Meden making light work of cutting all the grass. Note: This page has not yet been updated from the old website. We will be working on it as it appears there will be some major accomplishments in the near future. 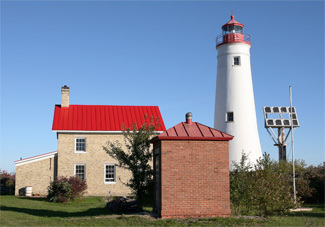 The Thunder Bay Island Lighthouse Preservation Society is a vital part of the local community. 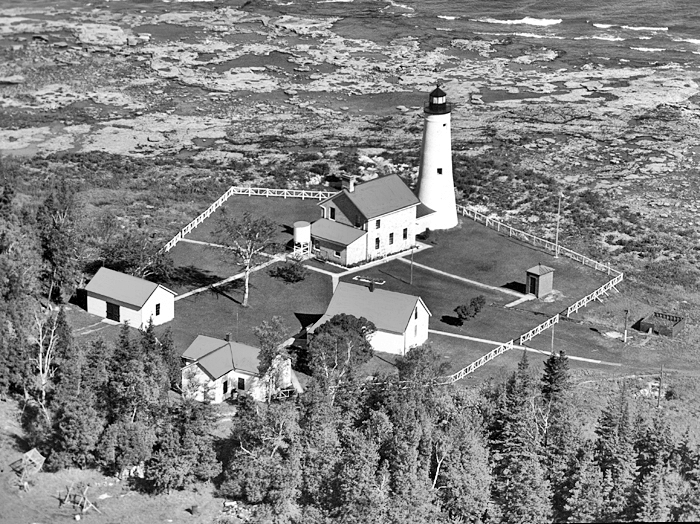 This all-volunteer organization has been instrumental in repairing the Thunder Bay Island Lighthouse and its attendant buildings to preserve them for future generations. The following are just some of the Society's accomplishments over the last 21 years. Applied for, and received, a Michigan Lighthouse Assistance Program grant for the replacement of the roof on the Keeper's Quarters and the passageway to the tower. Applied for, and received, a grant from the Wal-Mart Foundation to assist in the roof replacement project. Assisted the International Boundary Commission with the installation of a new brass marker in exchange for survey services on the island division line. Awarded the bid for the roof replacement project to Meridian Contracting. Completed the red standing-seam metal roof on the Keeper's Quarters and the passageway to the tower. Initiated a limited-edition fine art calendar fundraising project in conjunction with the Alpena County Library and the Thunder Bay National Marine Sanctuary. Installed commemorative engraved bricks into the formed pad around the flagpole on the island. Endowment fund received all funds raised. Contact the Society for information on purchasing a commemorative brick for placement on Thunder Bay Island. Took 2nd place in the Fourth of July parade and received a plaque and a prize of $250. Began documentation for the interior renovation of the Keeper's Quarters. Established the Thunder Bay Island and Cultural Resources Endowment Fund, a permanent endowment fund, with the Community Foundation of Northeast Michigan, using the money earned from the fine art calendar project. Applied for, and received, a Community Foundation grant to renovate the Rehkopf Room on the second floor of the Keeper's Quarters. Held a summer picnic on the island and dedicated the Rich Plume Memorial. Rich Plume was a Society member who is now deceased. Requested and received approval for a three-year partnership with Huron Pines to re-establish the wooden boardwalk from the former Life Saving Station. Completed the painting of the Rehkopf Room. Participated in local fund raisers such as a pancake dinner at McDonald's and Art on the Bay at the Brown Trout Festival. Completed the framework for the closet displays in the Rehkopf Room. 2014: Completed the transfer of the southern 43.08 acres of the island to Alpena Township, with TBIPS as their property managers. 2015: Received a grant from the Community Foundation for Northeast Michigan for black wrought iron sign posts on which to install the beautiful sign presented by the US Department of Interior, Bureau of Land Management, during the transfer ceremony.